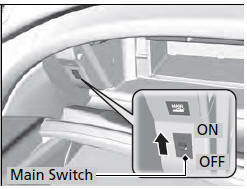 The trunk main switch disables the trunk opener on the driver’s side and the trunk release button on the trunk lid to protect luggage in the trunk. 1. Make sure the rear seat-backs are not folded down. 2. Turn off the trunk main switch in the glove box. 3. Lock the glove box. The trunk release button on the remote transmitter is always enabled, even when the trunk main switch is off.